With the polar vortex refusing to stay in its own backyard, snow blower owners are facing a new set of problems: snow blowers that take one look at the cold weather and decide it’s too frosty to go to work. 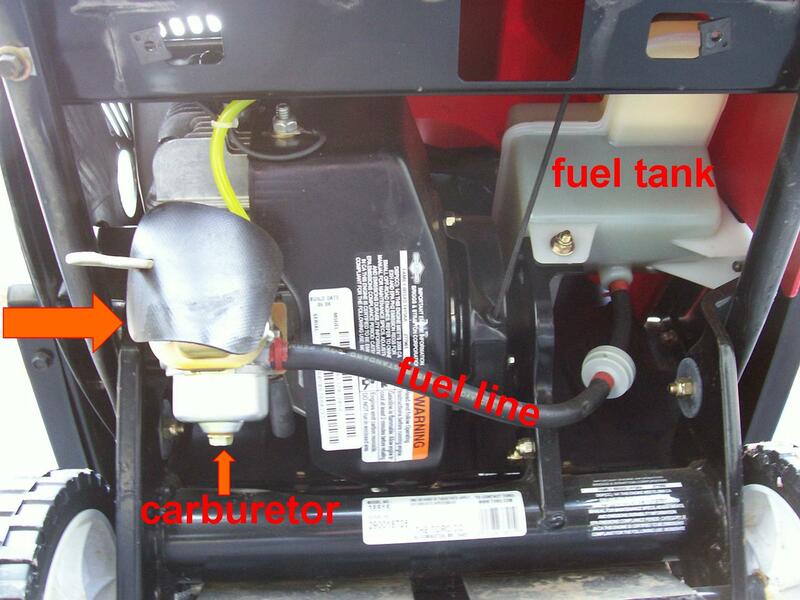 Here are some troubleshooting tips to coax your snow blower to start. Sometimes, the most frustrating problems are the ones with easy solutions staring you right in the face. In this case, a non-starting snow blower could be as simple as making sure the fuel shutoff valve is in the “ON” position. Another place to check is the throttle; it should be positioned to three-quarter speed or higher. If either has happened to you, don’t worry. Nobody saw. Just like you’d be grumpy if you had to go to work in the frigid cold on an empty stomach, so, too, is your snow blower. Make sure the tank never gets too empty, topping it up just a little bit each time you use it. If you’ve stored it and are taking it out for the first time this winter, one problem may be the volatility of the fuel. Adding fuel stabilizer to the gas before storing it is the easiest way to combat “lazy” volatility. But if it’s a hindsight problem, simply drain the system through the carburetor and then add new fuel and stabilizer. And remember to always check the oil. As for how to check for a correct gap and adjust an incorrect one, this video offers a step-by-step tutorial. Manual or electric starters can be a little finicky, which is why having an optional electric starter is a pretty good idea: there’s always a backup plan in case one starter doesn’t work. If that’s not the case, applying safe heat is a quick solution, but the problem will likely flare up again once the temperature drops. 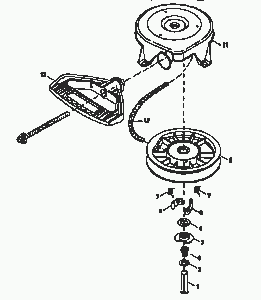 Snow blowers with manual starters have a metal “dog” (or metal tab) that’s susceptible to freezing, so remove the starter to find the “dog.” The pulley doesn’t have to be removed, just the center screw so lube can reach the pivot area. Just make sure not to use grease because it’ll gum up in cold weather. Sometimes, the starter gear can get frozen to the shaft, resulting in a spinning sound with no engine turnover. To combat this, first thaw with safe heat, and then put a light coating of lube on the gear shaft. Some snow blowers don’t require you to remove the starter, as you only need a spray lube with a nozzle extension on the shaft, but others do. If you’ve been hit with another round of the polar vortex, make sure you’ve got a Toro or Ariens snow blower that can handle anything Mother Nature hands out. Take a look at our selection of the best snow blowers on the market, and enjoy free shipping on any one you choose. A snow blower is a powerful machine, able to grab heavy snow and ice, grind it up, and throw it dozens of feet in the air. But when people are careful with their machines, accidents can happen. The longtime Colorado Avalanche hockey player got tangled up with a snow blower- literally. Snow was packed in tight inside the machine and though he had turned it off, he still reached inside the auger. Sakic ended up with three broken fingers and severe tendon damage to one of them, and was scheduled to miss about three months devoted to healing and rehabbing. In 2010, this then 15-year-old pitcher– usually tasked with clearing the snow outside- ran into problems with the snow blower. His parents had told him there was a dangerous main blade inside that could cause a lot of damage, so he kept his hands away. But where he didn’t was inside the chute, the location of a second blade that was still spinning very fast. McGill ended up shaving the tops off his index and middle fingers on his right- pitching- hand. He tried returning to baseball, but performed so poorly he’s considering the finger-less sport of track. An unnamed woman in Grand Forks, North Dakota left her snow blower safety smarts inside when she cleared her driveway. It’s not quite clear how the accident happened (her husband was using the snow blower), but she wandered too close and got her pants caught in the auger. When paramedics arrived, they had to cut her leg free from the blades, although one foot had already been run over. This 34-year-old carpenter of Mineola, Long Island should have been used to using safety, as he uses sharp tools in his profession. But fell one step short of complete precaution: Gianfrancesco turned off his snow blower, but used his hand to reach in and clear the clogged snow, and not a wooden or plastic handle. Because of his mistake, he almost lost the tips of two fingers. Luckily, surgeon Dr. Tommaso Addona was able to reattach them and predicted he’d have full use of his fingers in three months. In eastern Canada, an unnamed man was using a snow blower at work when, thinking the machine was off, he stuck his hand into a snow blower to clear it. It wasn’t, and he lost part of his hand. There’s a pattern here: even if you’ve turned the snow blower off and unplugged it, never reach in with your hand to clear clogged snow. Using a stick instead is a much better idea, but with our selection of Toro and Ariens snow blowers, chances are the power and efficiency of these machines will do the job just fine. Enjoy free shipping to the lower 48 states. Winter is only a few weeks old, which means it’s still not too late to invest in a snow blower. But how do you know which one is the right one? Here are several things to look out for. Do you find yourself have to slouch or stand on your tiptoes to navigate the snow blower correctly? Or do you stand in a natural posture and find using the snow blower easy and comfortable? Where are the handle and chute adjustment located? How does it respond to turns, and how tight can you turn the snow blower? Does it snow a lot where you live? If so, a two-stage snow blower will probably be more appropriate, but the added power can make handling them a little more difficult. 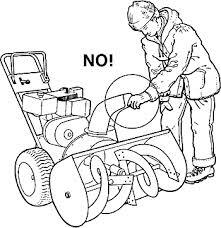 When buying a snow blower, make sure that it contains a “dead man control”, a safety feature that halts the auger or impeller as soon as you let go of the handlebar grips. This immediate stop vastly increases the safety of your snow blower and goes a long way in preventing accidents when unforeseen obstacles pop up. Another control to look for on a single stage snow blower is a long handle (joystick on two stage snow blowers) you can use to switch the height and throw direction of the discharge chute so snow goes exactly where you want it to. If you’re buying a two-stage snow blower, also take a close look at the drive control that lets you use both the drive wheels and auger with one hand, and the chute with the other. To make sure it’s extra safe, get one with a handlebar-mounted trigger release that disengages power to one or both of the drive wheels, as your steering control will be much easier. You can choose from a gas-powered or corded snow blower (with many models offering both, like the NAME). While you do have to exercise more caution in using a corded snow blower and you’re tied to a certain radius, plugging in a cord instead of yanking one can be a welcome respite in cold weather. If you live in an area that doesn’t get much snow, or your property is fairly small, a single stage snow blower will usually suffice. 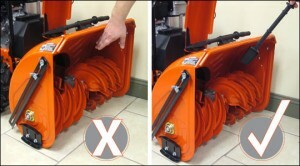 However, single stage snow blowers only come with one speed, which does limit their power and snow-clearing abilities. But when you look at two stage snow blowers, they usually come in five or six forward speeds, which can come in very handy when you’ve got a heavy or wet snowfall that requires more muscle. Ignore what the salesperson is telling you about bigger engines being better, and figure out exactly what’ll work best for your property. A heavy-duty two-stage snow blower will be far more useful for someone living in the heart of Wisconsin, and an overpaid purchase for someone in Kentucky. Do your research beforehand, and go with what you need, not what looks fancy. With just a little bit of reading, it’s only a matter of time before you find the perfect snow blower. And with Snow Blower Source containing only the best models on the market, take a look at the Toro and Ariens snow blowers to find the one that’s just right for you. As always, there’s free shipping to the lower 48 states. 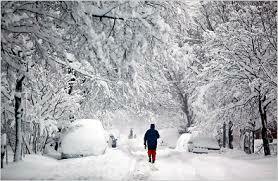 By now, everyone’s familiar with the term “polar vortex” and the cold weather its brought into the United States. 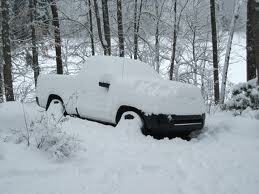 But depending on where you live, a big storm may mean you may have to clear out a lot more snow than you bargained for. If your idea of a workout is to get up from the TV and manually change the channels, it’s a good idea to go at snow clearing easy and slow. Clearing snow, especially when it’s wet, thick, and heavy, can be a trigger for medical emergencies, especially if you have pre-existing conditions like high blood pressure. Start by clearing a small swath of snow and going at it lighter than you think you need to, even if it’s tempting to best your neighbor. While it may be nice to clear large patches during commercial breaks, it’s even nicer spending the night in your own home and not a hospital. A huge snowfall makes it really hard to see stray objects on the ground, objects that you can easily run over with your snow blower that can get spit out and cause damage. Push your snow blower slowly but confidently, and be ready to turn it off if you feel anything underfoot that could be dangerous. But should something get caught in your snow blower and you need to get it out, turn it off and unplug it first. You’d probably be okay if you just unplugged it, but the chances just aren’t worth taking. By removing it from a power source altogether, you can avoid potentially serious and lasting injuries. A poorly maintained snow blower is one of the main reasons serious accidents happen, so always make sure yours is running smoothly. Make sure oil and gas levels are topped up to where they need to be, there are no loose, stuck, frayed or dry parts, and the engine sounds good. 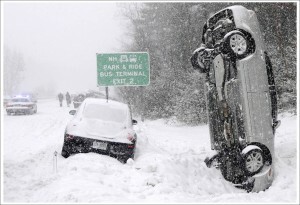 If your gut is telling you that something’s amiss, skip this snow clearing for now and take care of the machine first. The snow will still be there, waiting to be cleared. Whether you’re using a Toro or Ariens snow blower this winter, or shoveling until the right Toro or Ariens comes along, make sure you’ve got the best of what Snow Blower Source has to offer. Check out our selection and enjoy free shipping to the lower 48 states. Whether it’s global warming or just Mother Nature giving us a swift kick in the rear end, this winter has been intense, to say the least. Here are some of the ways snow blowers have snuck into the news. A recent spate of winter storms has meant that homeowners are loading up on snow blowers in record numbers, with the first one of 2014 bearing down on the Northeast. Last night, snow began falling in New York and New England, paving the way for will be a mighty snowfall today and tomorrow. People can expect to see as much as a foot of snow in some areas and it’ll have to get cleared one way or another, whether by shovel or by snow blower. Michigan and Illinois have already been hard hit, with 12 inches falling in the former and 6 in the latter, scuttling hundreds of flights and leaving people scrambling to find a way to get around. But for those who didn’t have to go further than the end of the driveway and had a snow blower, the storm wasn’t too bad. But if you’re a snow blower owner, make sure to always lock it up in your driveway, or you could fall victim to snow blower thieves like these people. Canadians are typically thought of as our polite, do-good neighbors to the north who are born with snow in their veins, but a couple of mishaps with snow blowers lately seem to have punctured that image a bit. In the eastern end of the country on Prince Edward Island, two separate accidents have raised caution that snow blowers need to be treated with utmost care and caution. Poor visibility caused one man to crash his snow blower through the window of Robin’s Donuts in the middle of the night, smashing the windows and causing about $10,000 worth of damages. Another man in Summerside got his hand seriously caught in his tractor-run snow blower. Make sure when you’re using your snow blower that you go cautiously and with control, and always turn off (and unplug) your snow blower if anything seems off or stuck. This winter, always use extreme caution when using your snow blower, especially with storms coming in that can severely reduce visibility and hamper snow clearing efforts. Bundle up warmly, and check out our selection of Ariens and Toro snow blowers to make sure you’re using the best machines on the market. All products are shipped FREE to the lower 48 states, and you can usually find something on special that’s just right for you.